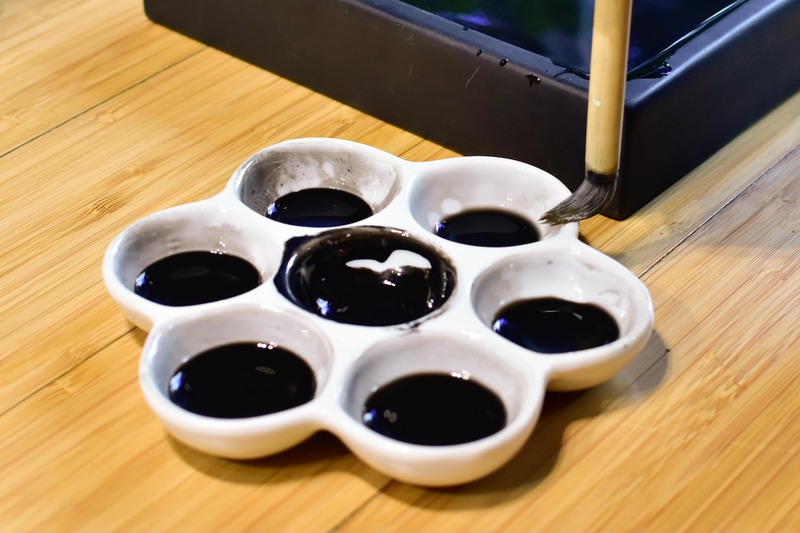 Have you ever experienced “rubbing a sumi ink”? 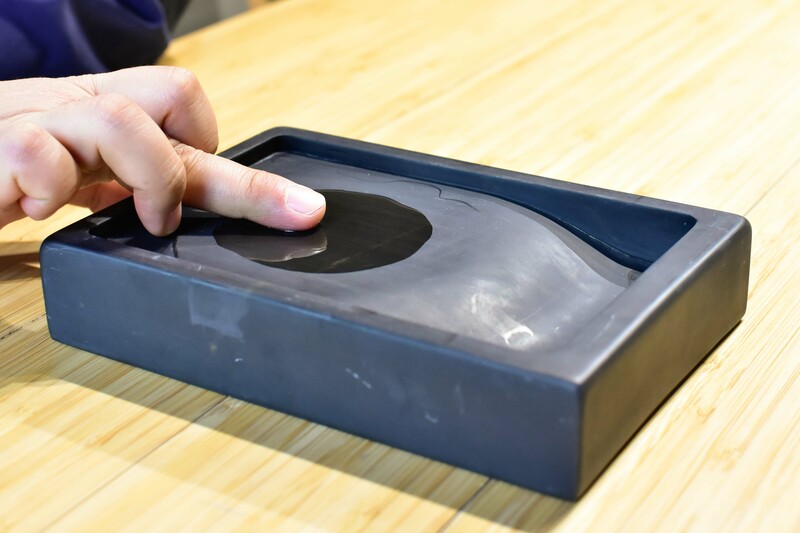 Holding a sumi ink and putting it onto an inkstone, gently kneading with water and creating the sumi ink slowly. It is just an irreplaceable moment. The delicate tone of soot and animal glue is the fruit of wisdom and beauty, which has been passed down through eastern art history. “Rubbing” the sumi ink may not be familiar with you, but once you get how to do it, it is actually easier than it looks. 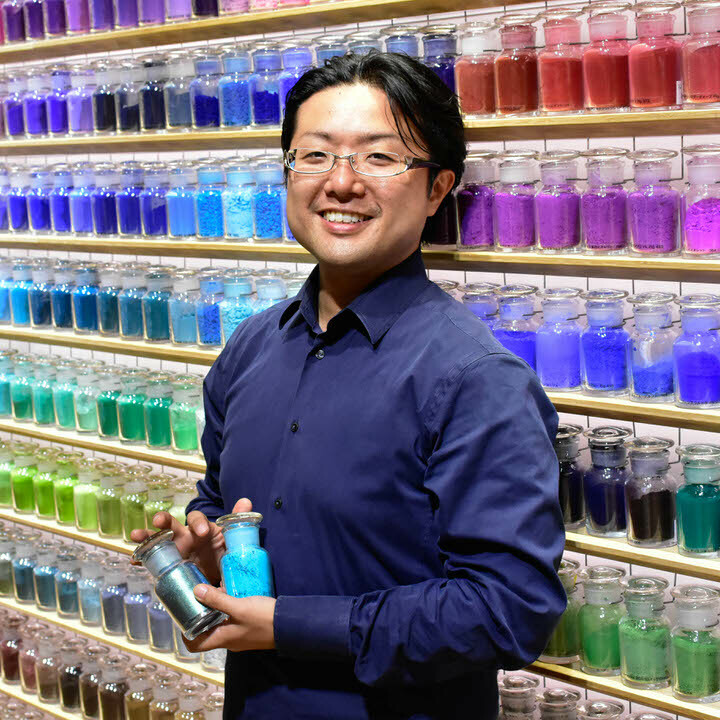 This article will introduce you how to rub sumi ink by the way the PIGMENT lab chief Iwaizumi recommends. Please take this opportunity to experience the deeper world of sumi ink. You will soon find the beauty in its color, which is different from the usual black color in the paint tube. 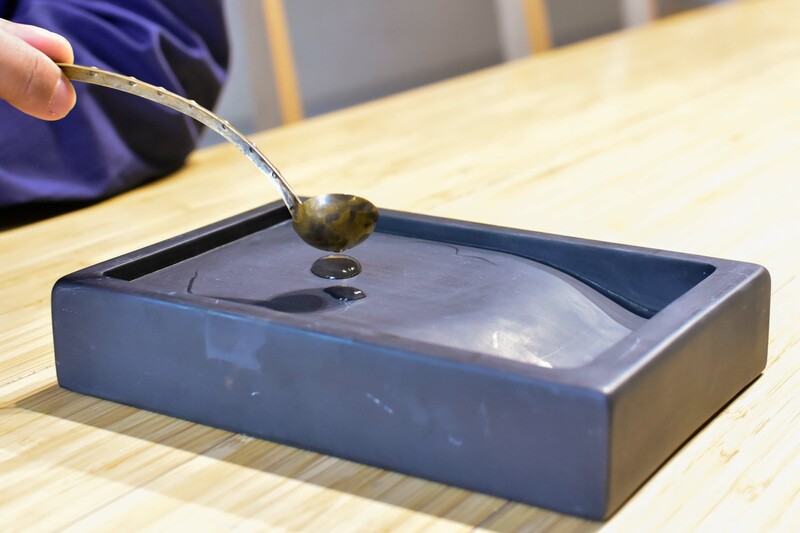 First, dropping water onto the ink stone with spoon. Then, spread the water a little bit by using your middle finger. Holding a sumi ink stick diagonally and rub it as to slide up and down. Holding a sumi ink stick diagonally and rub it as to slide up and down. Then, turning the ink stick over and rub again to make the cross section in a V shape. 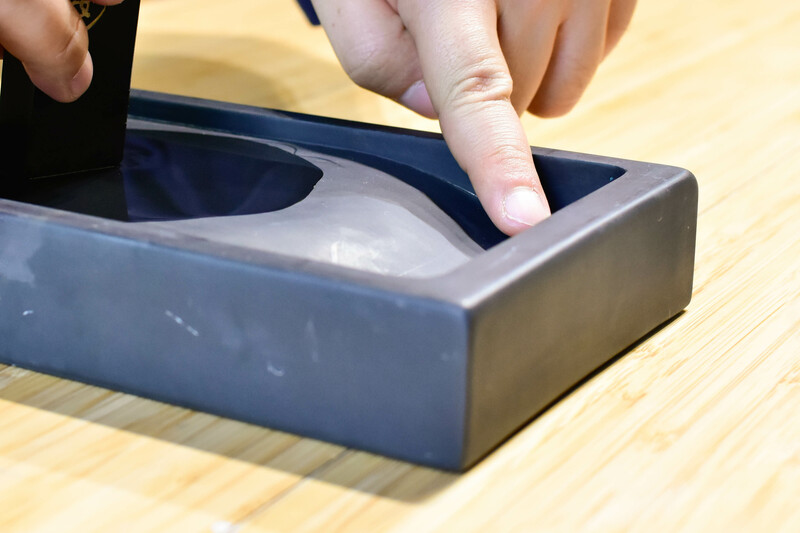 Holding a sumi ink stick perpendicular to the inkstone and tub it as to draw a circle. Each has its own benefit, but the most important thing is not to put too much strength when rubbing. 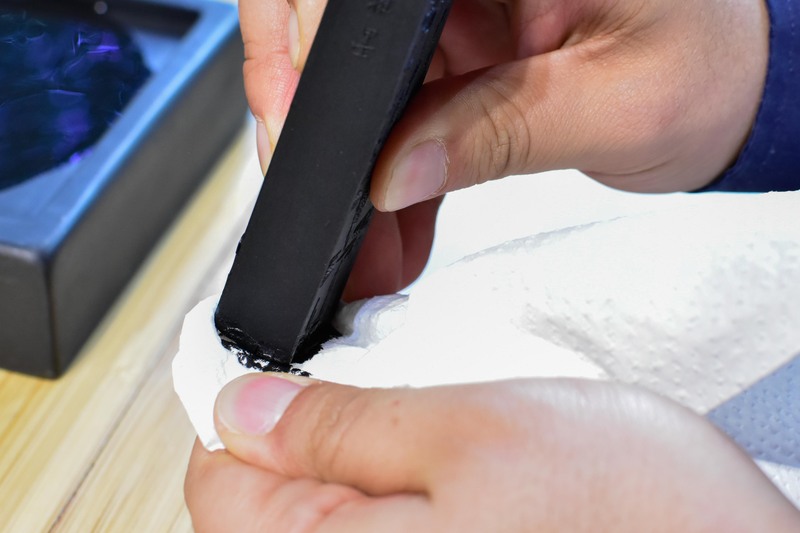 If you rub too hard, the inkstone might get damaged or it lessens the color quality. Therefore, keep in mind to rub it just like you gently stroke the baby's back. We, as the PIGMENT lab, recommend the type C as it requires less power to rub. 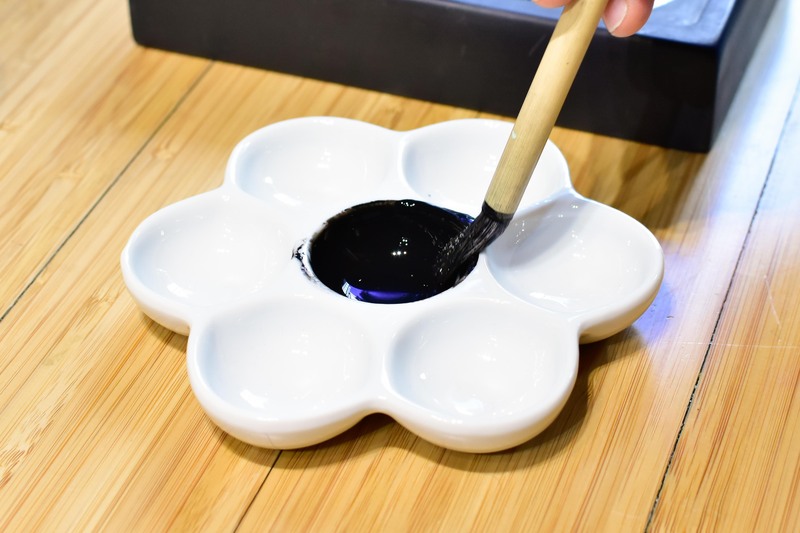 This way, you will be able to create the sumi ink in a gentle manner. 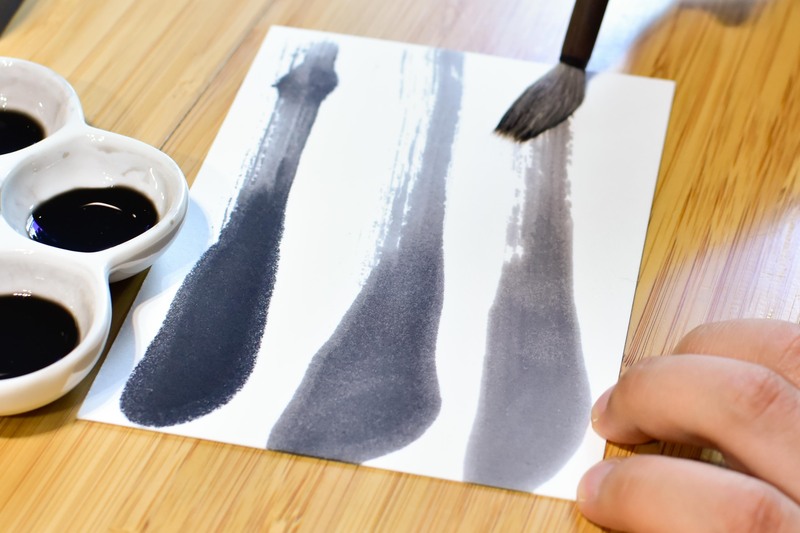 Sumi ink can create various expressions in color by its light and shade. It is important to note that even when you want to have a lighter color, such as gray, the first thing you will need to do is to rub sumi ink until it gets thick and dark. That is because when you use the sumi ink that is not rubbed enough, you cannot make the best use of the natural color. The essence of rubbing sumi ink can be seen in the Kanji for “rub”. You might think of ”擦る” as the Kanji for rubbing, but it actually is written as “磨る”, which means to “polish”. Therefore, when you rub sumi ink, imagine as if you “polish” it. 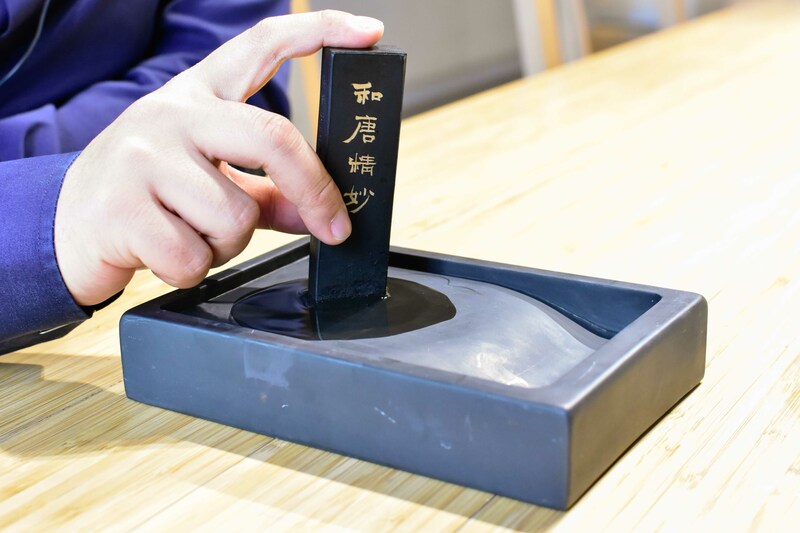 Gently and firmly rub onto the flat inkstone so that you can get the rich sumi color. 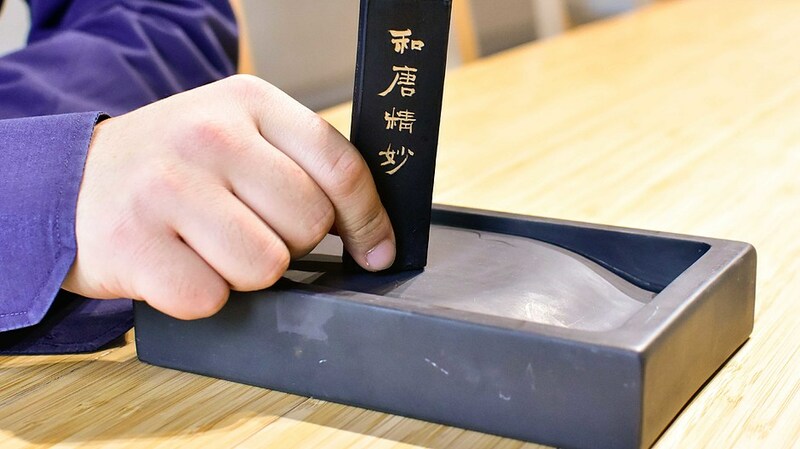 The tip to recognize whether it is rubbed well enough or not is the “viscosity”; please make sure that the ink gets thick enough that you could see the bottom of the inkstone when you rub. If it is less watery compared to the first time when you rub the sumi ink, you are ready to use. Also, there are some inkstones that have a dent in front. This area is called “pond” and we never keep the sumi ink in here. In China, people put water here and add it to the sumi ink when needed. Please be careful for people who have this type of inkstone because if you keep the sumi ink here, you cannot mix water and sumi ink well enough and rub them. 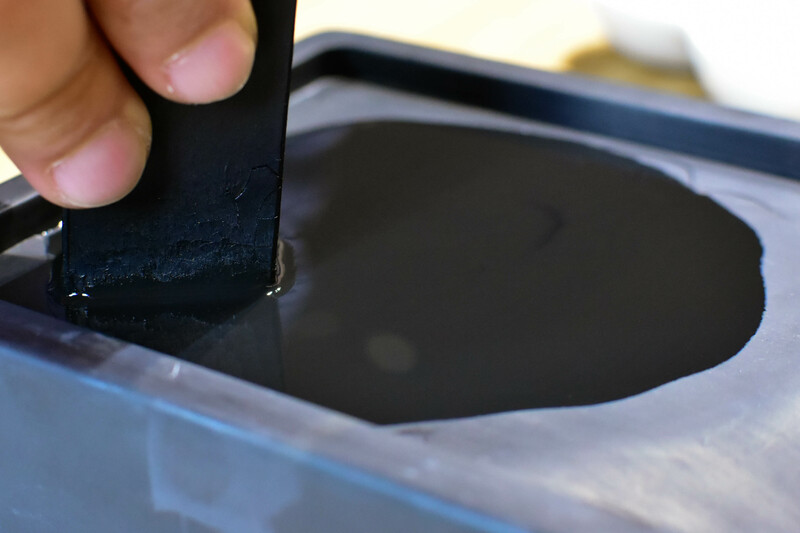 After rubbing sumi ink, please wipe it with some paper towel in order to prevent the cross section from cracking. 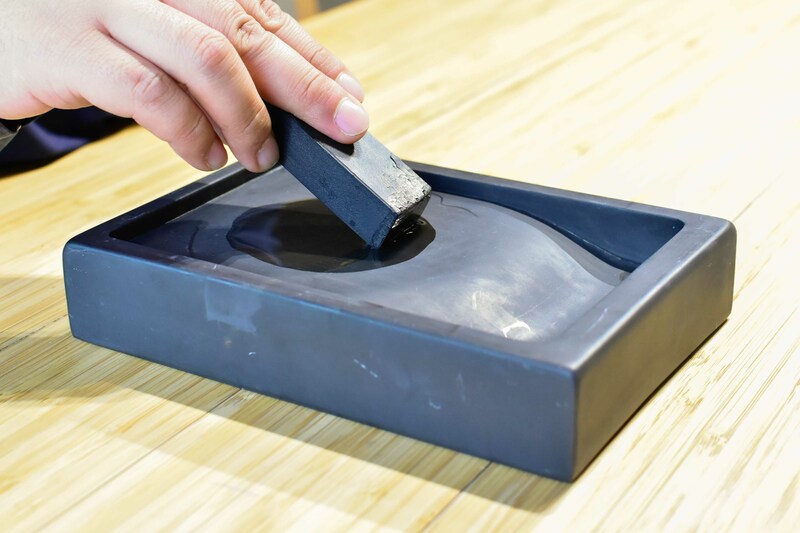 Then, prepare the ceramic plate and scoop the sumi ink from the inkstone to the plate. Please use the old brush for this because new brush will be worn out with the inkstone, which can even rub the hard sumi stick. For the same reason, please refrain from putting the brush directly onto the inkstone not to damage it. For the container to which transfer the sumi, we recommend the palette like this plum motif. In order to prevent it from dry, it is useful if the container has a lid. 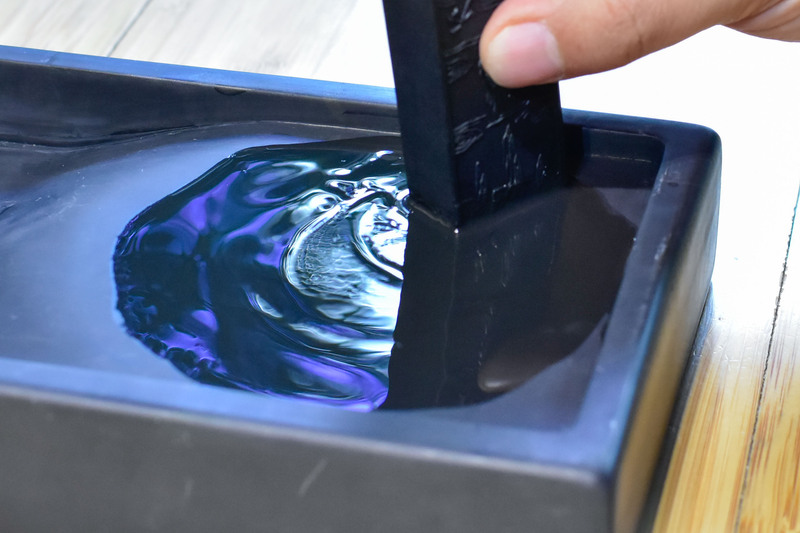 After moving the deepest color to the container, please add water little by little to the inkstone and repeat the same process to make a color gradation. When you want to use the lighter tone, adjust the light and shade in this process. By this process, you will be able to create the natural rich color. Please enjoy the world of sumi that looks simple but has actually a deep story behind. 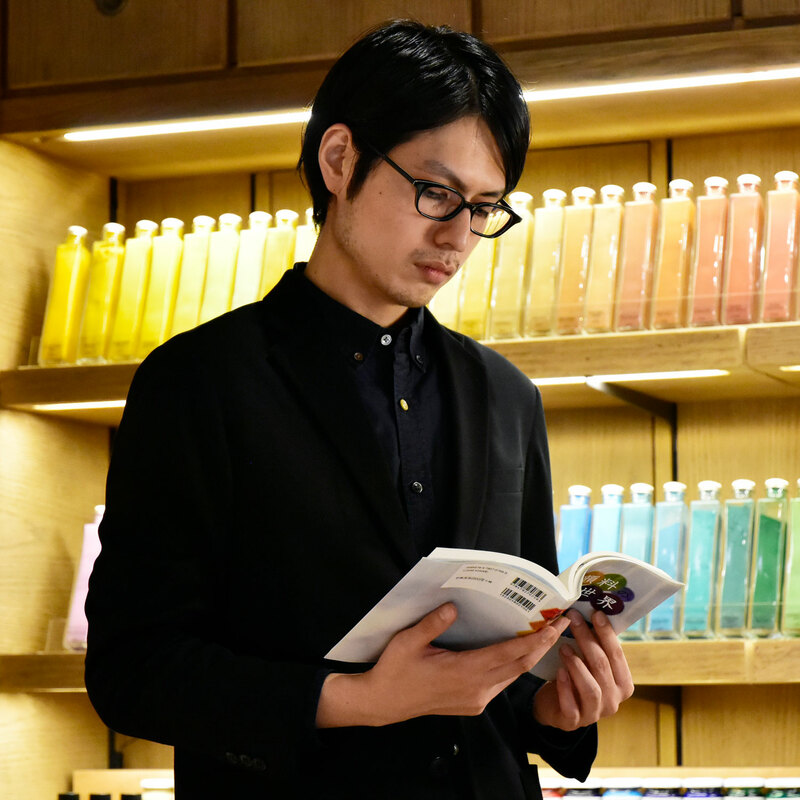 In PIGMENT TOKYO, there are art materials and pigments available both online and in store. For anyone who wants to try sumi ink but has no idea what to choose, we will explain everything and will find the best one for you. There are also various workshops to learn more about sumi ink. For more information, please check out our website.